I was at work yesterday, where the firewall prevents me from seeing the streaming video (which is probably a good thing, given my obsession with the game), so I didn’t see the image get taken. But when I got back from lunch and saw it in the Public Gallery it had already picked up two votes for Bullock’s Oriole (along with one for Lesser Goldfinch), and hence had been classified by the system as a Bullock’s Oriole. And my first reaction was, “yeah! a new species!” I wanted to enter my own ID so I could see who’d voted on it already, but then I paused, and said, wait. Is that really a Bullock’s Oriole? So I got out my Sibley guide and started doing some comparisons. And I pretty quickly came to the conclusion that if that was a female Bullock’s Oriole, it was just as likely to be a female Hooded Oriole. And after thinking about that for a minute, it occurred to me that really, if I saw that bird myself, I wouldn’t be thinking oriole at all. I’d be thinking tanager. 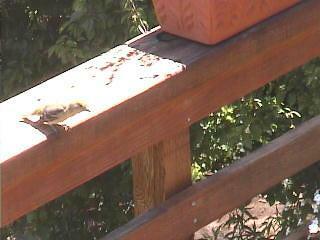 The bird is too large for a goldfinch. The silhouette (relatively large head, relatively short tail, and relatively thick beak) all say “tanager”, rather than “oriole”. The tail itself is pretty hard to see in the image. But we have a beautiful view of the tail’s shadow, which is deeply notched. To me, that’s the ballgame right there. I’ve never seen an oriole with a deeply notched tail. I’m convinced: It’s a tanager. We’ll see what the experts think. So far I seem to be the only person crazy enough to see this as a Western Tanager, and judging by my going down in flames in my effort to get #6320 classified as a Chestnut-backed Chickadee, my ability to influence the direction of difficult IDs is questionable at best. Oh well. You win some and you lose some. Or you just lose some. But that’s the nature of the game. It’s still really fun to think about it, and the learning that goes along with the thinking is one of the things I love most about birdwatching. This entry was posted on Tuesday, May 8th, 2007 at 7:03 am	and is filed under Records and Rarities, The Birds. You can follow any responses to this entry through the RSS 2.0 feed. You can leave a response, or trackback from your own site.